The birth centenary of Fr. Marcelline Jayakody, the well known Catholic priest, musician, lyricist, author, journalist and patriot falls on June 03, 2002. An exponent of indigenous culture it was Fr. Marcelline Jayakody who directed the Catholic Church towards the mainstream of national life. A household name in our country, Fr. Marcelline Jayakody had an eventful career, replete with ups and downs. He was stronger in defeat and all his defeats later turned out to be victories. He had the Midas touch and everything he handled turned into gold. Fr. 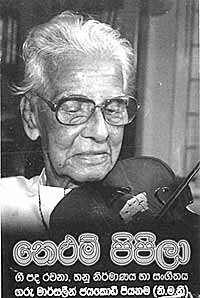 Marcelline Jayakody lived long till the ripe old age of 96 and passed away on January 15, 1998. Fr. Marcelline Jayakody was born on June 03, 1902 at Dankotuwa on the outskirts of Maha Oya. He had his early education at Madampe Sinhala School and secondary education at St. Josephs College, Colombo. He had to suspend his education for one year at St. Josephs, because he could not afford to pay the school fees. In 1920, Fr. Marcelline Jayakody entered St. Bernards Seminary. He wan ordained a priest of the OMI order on December 20, 1927 by Dr. Anthony Courdert, the then Archbishop of Colombo. There was always the love for national culture in his veins. In the beginning of the 20th century slavishly imitating the West was the order of the day. At the same time there was a national resurgence led by patriots like Anagarika Dharmapala, Walisinghe Harischandra, Piyadasa Sirisena and John de Silva. The Christians who believed in the Western way of life was severely criticised by the well known novelist Piyadasa Sirisena. Fr. Marcelline Jayakody read the novels of Piyadasa Sirisena with interest and drew inspiration from his works. Fr. Marcelline Jayakody as a young priest was at the centre of controversy for offering some Lotus flowers at the sanctuary at the wedding Mass of one of his relatives. Since then much water has flowed under the bridges in Sri Lanka. Now the national culture is given its due place in the Catholic Church. And Fr. Marcelline Jayakody is considered as an exponent of indigenous culture. Fr. Marcelline Jayakody served as an assistant parish priest at Kotahena, Pamunugama, Kochchikade (Negombo) and Kandana. He served as the parish priest in Paiyagala, Duwa, Katana and Maggona. As parish priest he gave the altar a national aura bedecking it with Gokkola an Ralipalam. When Fr. Marcelline Jayakody was the parish priest of Duwa, the Duwa Passion Play was performed with images of sacred personages based on the centuries old "Nine Sermons" in "Dukprapthi Prasangaya" written by Fr. Jacome Gonsalvez. Fr. Marcelline Jayakody revised and re-casted the Duwa Passion Play, while maintaining its traditional outlook. He used human actors for all the scenes except for Christ and Mary. He also composed all the hymns in addition to the traditional "Pasan". Since then the fame of the colourful Passion show of Duwa spread far and wide. At that time the Duwa Passion Play performed with over 250 actors all drawn from the island hamlet of Duwa was considered as the greatest Passion show in Asia. The credit of introducing Catholic hymns with both the Christian aspects and national outlook should go to Fr. Marcelline Jayakody. In 1940s and 1950s there was a national renaissance in Sri Lanka around Independence. This national consciousness had its effect on the Catholic Church as well. Fr. Marcelline Jayakody too began to compose outstanding hymns like "Ronata Vadina Bingu Obay", "Nelum Pipeela Pethi Visireela" and "Suvanda Jale Pipi Kumudiniye" with a national flavour. These magnificent hymns with their superb lyrics, sweet music and national setting captivated the hearts of all. The hymns of Fr. Marcelline Jayakody are simple and close to people. They are appreciated even by non-Catholics. They are a striking example for cultural adaptation in its true perspective. Most of the popular hymns sung in churches today are compositions of Fr. Marcelline Jayakody. In 1949 Fr. Marcelline Jayakody was invited to train the choir for the song "Namo Namo Matha" for the first Independence anniversary as the composer of the song Ananda Samarakone had gone abroad. Fr. Marcelline Jayakody rose to the occasion, trained the students of Musaeus College and presented it to be acclaimed by all. This magnificent performance had gone a long way to adopt "Namo Namo Matha" later as our national anthem. In late 1949 Fr. Marcelline Jayakody was appointed the Editor of the Catholic weekly "Gnanartha Pradeepaya". It was Fr. Marcelline Jayakody who set up the caption of "Gnanartha Pradeepaya" in a traditional setting and this caption is still continued. He increased pages from 08 to 12 and introduced new features with an indigenous outlook. Fr. Marcelline Jayakody could not stay long in "Gnanartha Pradeepaya". The manager of the paper insisted that Fr. Marcelline Jayakody should closely follow the English Catholic weekly "Messenger". Fr. Marcelline Jayakody refused. The manager took up the issue with the Archbishop of Colombo. The Archbishop ordered him to present the news and articles in the "Messenger" in Sinhala. Fr. Marcelline Jayakody again refused explaining that it would amount to translation and not Journalism. He then left "Gnanartha Pradeepaya" for Shanthinikethan in India. Today "Gnanartha Pradeepaya" is far from being a translation of the "Messenger". It has a distinct identity and the stand of Fr. Marcelline Jayakody is vindicated. Fr. Marcelline Jayakody underwent some training at Shanthinikethan, the famous Oriental arts centre set up by Rabindranath Tagore. When he returned to the island from Shanthinikethan he was sent to Tolagatty in Jaffna for leaving the country without the permission of the Church authorities. Later he served in the staff of St. Patricks College, Jaffna. Fr. Marcelline Jayakody made use of his stay in Jaffna to make a study of Hindu religion and Tamil culture. He wrote a series of articles to "Times of Ceylon" on Tamil culture, simple and serene life of people and beauty of Jaffna. Be also presented a Passion play with the students of St. Patricks College. In 1953 Fr. Marcelline Jayakody was appointed to the staff of St. Peters College, Colombo. At St. Peters with the assistance of Heenbaba Dharmasiri he set up an Oriental arts centre and introduced indigenous fine arts to this leading Catholic school in the metropolis. The film "Rekawa" presented by Lester James Pieris in 1956 was a landmark in Sinhala cinema. This was the first Sinhala film with a real indigenous outlook and it won several international awards. Lester James Pieris got Fr. Marcelline Jayakody to write lyrics for songs in "Rekawa" and Sunil Santha to provide music for them. "Rekawa" generated such an enthusiasm on Sinhala cinema, "Sunday Observer" conducted a poll to select the leading personality in the film world in 1956. It was found that Fr. Marcelline Jayakody was leading the poll from the beginning. Fr. Marcelline Jayakody who did not want to take any undue credit made a declaration that he only wrote lyrics for the songs in "Rekawa" and it was Sunil Santha who set the music for them. But that did not make any difference. At the end Fr. Marcelline Jayakody won the poll defeating such stalwarts in the Sinhala cinema like Rukmani Devi, B. A. W. Jayamanne, Laddie Ranasinghe, Sirisena Wimalaweera and Mohideen Baig. Dr. W. Dahanayake, the then Minister of Education who presented the award said: "If I could write a single song like this  I consider it a greater achievement than being a minister". In 1976, when Thomas Cardinal Cooray retired from the post of the Archbishop of Colombo remained vacant for nearly an year. Several priests contended for the post and there were various groups supporting one or the other. There was petitioning to the Holy see in Vatican as well. At this time Fr. Marcelline Jayakody was carrying a regular column in the "Messenger" and continued the column even from abroad. Fr. Marcelline Jayakody in his column wrote that the best qualification for a Bishop are found in Gospel values preached and practiced by Christ. This created a ripple in the bastions of power in the Catholic Church and the popular column of Fr. Marcelline Jayakody was discontinued. Fr. Marcelline Jayakody instead wrote a series of poems to "Kaviya" magazine appreciating Buddhist Sinhala culture. "Muthu" was the collection of his poems carried in "Kaviya". "Muthu" won Fr. Marcelline Jayakody the Presidential Award for the best poetry work in 1979 and the much coveted Magsaysay Prize in 1983. Fr. Marcelline Jayakody was the author of several works of both prose and poetry both in Sinhala and in English. He was a well known journalist who carried columns in both Catholic and secular press. He was an active member of the "Hela Havula" and for several decades until his death was the President of Sinhala Poets Association. Dr. Ittapane Dhammalankara Thera has written a book on Fr. Marcelline Jayakody titled "Malpale Upan Pansale Piyatuma". This book is presented as answers of Fr. Marcelline Jayakody to questions put to him. It has provided an opportunity for Fr. Marcelline Jayakody to express his views on current affairs. Fr. Marcelline Jayakody who had to suspend his education for lack of funds in one instance, praises the Free Education Scheme in no uncertain terms mindful of the fact that the Catholic Church did everything possible to sabotage it. He deplores the worldly outlook of some modern priests, their indiscipline and degeneration. He accuses of some N.G.Os doing damage to the country under the pretext of serving people. Those observations of Fr. Marcelline Jayakody would have offended some Catholic priests who have formed their own organisations, get foreign funds, wear lay clothes, lead indisciplined lives and attract scandal by their worldly behaviour. Fr. Marcelline Jayakody was a priest who practiced what he preached. He used a share of the money he received from the Magsaysay Award to set up an arts centre for the under-privileged. He donated another share for the Sinhala Poets Association. He set apart the balance for scholarships to poor students. He led a simple life with the barest of necessities. Fr. Marcelline Jayakody was honoured with the "Kalasuri" title by the State and "Kithu Nandana Pranamaya" by the Catholic Church for his magnificent contributions to arts and culture for over six decades. No other Catholic prelate or priest in Sri Lanka has touched the hearts and lives of both Catholics and non-Catholics alike like Fr. Marcelline Jayakody. Sincere to God and sincere to man Fr. Marcelline Jayakody was a legend in his life time.